Amateur radio, low power, wire antennas, and other related content. Yesterday I made my first PSK contact using FLDIGI. Today I decided I would post a few more details of my setup for those who care to see. 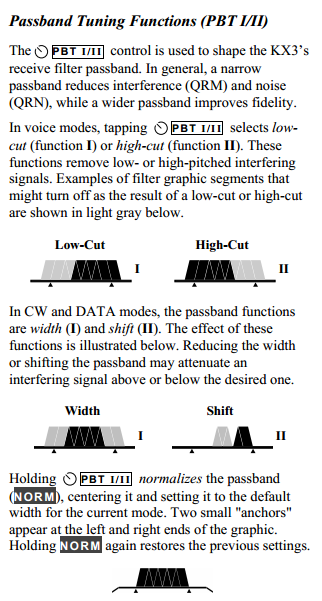 It is actually quite simple…and I later discovered some helpful hits in the KX3 Owner’s Manual that describes more details on data modes. 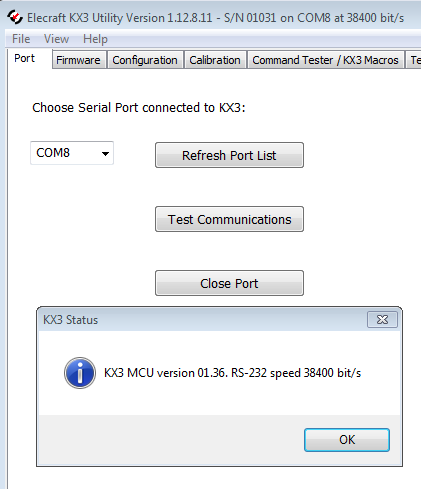 First I discovered my KX3 COM port by using the KX3 Utility and took note of the speed (shown as COM8). 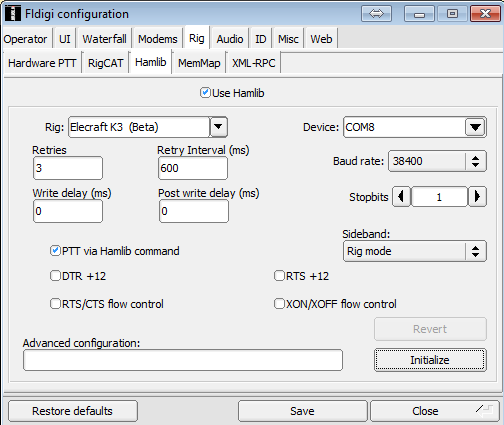 Next, I went into FLDIGI and set up the Rig control (here are my settings). NOTE: Hit Initialize to get the radio to talk with FLDIGI (if it errors out with IOERROR there is something wrong with your setup). I then configured the audio controls. You will notice that I am using Line In for Capture (microphone did not work in my setup). I also decided that I would set the levels for each audio device to 50%. Using the KX3-PCKT cable set (red and green/blue banded cables) I connected the KX3 Phones jack to my computer’s LINE IN jack. I then connected my computer’s Phones jack to my KX3’s MIC jack. My radio looks something like this (I don’t have a cable in the ACC2 jack). Once I plug everything in I could then see the waterfall. Now you need to set up your KX3. The KX3 Owner’s Manual covers the modes and setup in nice detail but here are a few basics. Set Power to less than 5 Watts. HINT: If you radio has TX red light on…but no RF power going out, just make a small adjustment to output power (going from 5.0 to 4.9) and that may “wake up” the KX3 and let it work again. Set mode to Data A. Note: I was able to transmit using USB (phone) mode…however the notes in the manual state that DATA A is preferred because it disables compression and optimizes transmit ALC. 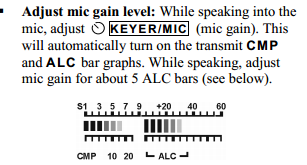 As mentioned in the last bullet from image above…you should adjust MIC gain to proper ALC levels. I found that I didn’t need to modify this much. Process is pretty easy…another good example of how to do this is below. In case you have adjusted the bandwidth (or if its set narrow) just turn PBT I knob so it shows approximately BW 3.00 (you should see the width on the waterfall). This entry was posted in Amateur Radio and tagged FLDIGI, KX3. Bookmark the permalink. Wow great post, I have the KX3 and have been trying to get it going with some of the SDR programs. A post that goes over the setup for SDR like you have done for the Data modes would be great. Thanks. Will do. Been meaning to do one on my setup with Na3P (Panadapter) and a logger program. Because you’ve asked…I will do this one next. 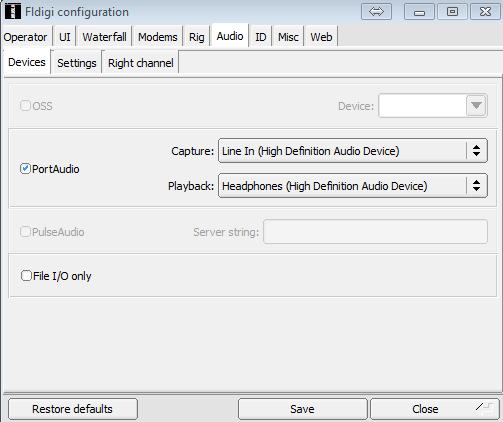 You may be able to use a computer speaker by routing your “line-in” audio to your “line-out/headphones” with software (with out of box solution or with a virtual audio cable). I haven’t tried to do it…but I am pretty sure that it can be done. Generally I don’t need the audio to tune because I leave the bandwidth open (about 3KHz) on the radio and visually spot signals within the passband audio going to FLDIGI. For PSK I generally don’t have to move much (as an example most PSK happens between 14.070 and 14.073 on 20M). For RTTY I will move much more…but will still visually spot the signals in FLDIGI. If I get to it I will experiment with this a bit more. This may be an easy thing in Windows to do. Great post. A buddy just bought a kx3 and boy, what a NEAT rig… Anyway, a couple of things I’ve run into so far. He is running xp or win7 and the driver for sound chip on laptop runs the show as opposed to MS mapper. Could not get audio from line in/mic to pass through laptop speakers and he’d really like to hear the audio. Linux would probably do a better job here I suppose. The cables that come with the kx3 are stereo. Found his sound chip was mono and if you fully engage the jack, fldigi sees only harmonic noise. 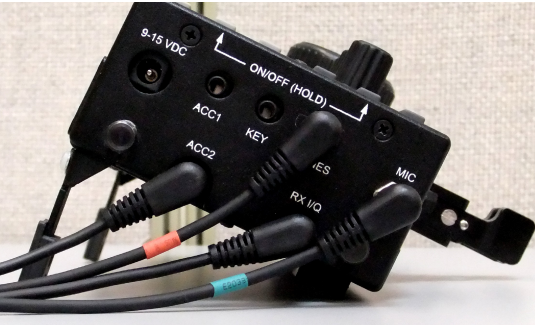 Need a stereo to mono adapter for these types of inputs. Where did you download hamlib for MS? A link should be on the page here! Fldigi still doesn’t sport an xml file for RIGCAT so Hamlib is a GREAT way to get around that gotcha! Thanks for the post. This will make my buddy happy to have radio control from Fldigi! Thanks for the comment Jaye. I don’t remember downloading Hamlib so I am thinking that it may be included in the windows version of FLDIGI (http://www.w1hkj.com/FldigiHelp-3.22/TransceiverControl.html). Neverthess it can be downloaded from various sources including http://sourceforge.net/projects/hamlib/. Tried this setup with laptop, but as soon as blue cable is plugged into computer phone jack, KX3 goes into transmit. Any suggestions would be appreciated! I have noticed this behavior as well when I connect the plugs into the radio. In my case the radio goes into TX (and with no rf power out) for a split second until I have the connector fully seated. Not sure how to help you if it stays in TX mode (once the connector is fully seated). You could try turning the radio off before you plug in to see if that helps but it likely won’t solve your initial problem. My Leveno ThinkPad does the same thing, as soon as the radio is connected or powered on while connected it begins transmitting. My only solution is to go back to using a SignaLink USB interface or possible purchase usb sound card. The question I have is were does the waterfall come from the RX I/Q port, where do you connect it to on your computer? Thanks Arnie…I hope this works for others who are facing this same problem. Thank you for the suggestion, however that did not fix the issue I’m experiencing, I purchased the packet cable set with my radio and I’ve tried both cables, same issue. I believe it must be something in the laptop versus a cable issue, the radio seems to work fine as well. I’ll keep looking for a solution. Please add a note here if you do find a solution. Seems to be an issue for a few other hams as well. I am curious about your set up…you mentioned having a laptop. I assume that you are using the laptop’s sound card and that you are using a “line in” jack rather than the “microphone” jack. Will you confirm? My laptop is labeled with a microphone so I’m assuming it’s a microphone jack. But my issue is really with the headphone jack. I recently picked up “The Elecraft KX3 – Portable” mini book by Fred Cady – KE7X and while reading it on page 113 might be a solution. He says “Line Out or Headphones out may have low enough impedance between the ring and the shield to activate PTT. If this occurs, you should use either a stereo plug with no ring connection or a monaural isolation transformer with no connections to the ring terminal as shown in Figure 7.7 You may also set MIC BTN OFF when you’re in a data mode.” I haven’t had a chance to build on yet and test it out but plan to do so, perhaps if someone else has already done so please let us know if it works. This apparently is a known KX3 bug that will be fixed. The current workaround (according to Elecraft) is to go into MENU and set MIC BTN to ‘OFF’ while in PSK31. Remember to reverse it when you go to SSB. Thanks Terry…I finally was able to replicate this same issue when I connected a Heil headset to the radio. The solution there was also to set MIC BTN to “Off”. Hi any updates on the Radio going on transmit when plugs are connected to the radio? Mine also goes on transmit. No solutions yet. What is your current setup? I am using Windows 7 laptop. Same settings as you have indicated in the post, same cables fom Elecraft. I will keep trying. Hello, I have had the same problem with my KX3 going into transmit and staying there whenever the laptop is plugged into the mic input of the radio. The solution I have found to be the simplest is BEFORE you change the mode to data, set the “MIC BTN” menu entry from PTT UP.dn or PTT, whatever you set it up as to “Off” You have to do that before you change mode to data as once in data mode that menu entry is disabled. Monty, thank you sharing the setup! I was able to set it up and at lest copy signals being transmitted. I am trying to get my KX3 set up without using signalink as you suggested but having some problems. One is where on the computer does the cable go from the KX3 marked as “RX I/Q”? Sorry for the late reply. Did you get this figured out? Hello and thanks for these informative setup pages; very helpful. I’m curious is you’ve managed to get FLDigig and Win4K3 Suite to play together nicely? I’ve been told that Omnirig needs to be used to handle the communications between the KX3 and the two programs, but I can’t seem to configure things correctly. Any suggestions would be greatly appreciated. I haven’t played with setup for quite some time…if I remember correctly I wasn’t able to get the two connected. I still think it can be done but wont be able to guide you at the moment. Thank you for the instructions, they work great. I am using a USB adapter for the audio from Headset Buddy and works great. Reblogged this on Fire Photo news. 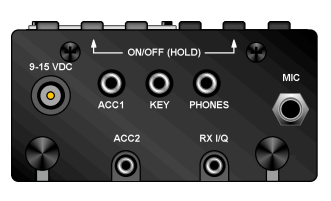 nice article been looking for info on digital modes with KX3. Hi Don. I had to search for this one since its been awhile and I no longer own the KX3. Looks like I may have had the RX/IQ going to the LINE IN jack on my sound card. 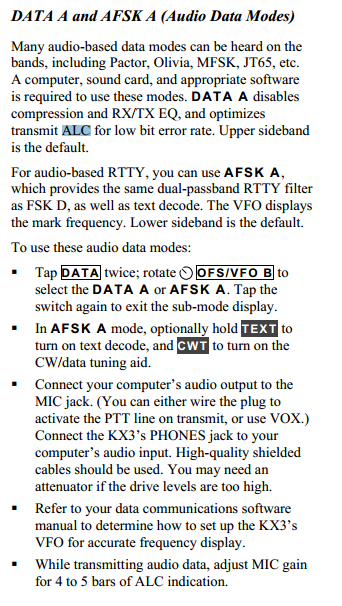 Elecraft’s “manual/instructions” on the cable set describes where each should go. Hi Monty, I too just now am setting up my KX3 for use with FLDIGI. I am using an older laptop dedicated to this running Linux Mint 18. I am using a signalink USB and all the audio connections seem to be working fine thanks to your blog. I haven’t made a contact yet but everything appears to be working fine.